The original ANDERIC RRYD023 Sony Remote Control is in-stock and ships within 24 hours. The original ANDERIC RRYD023 Sony Remote Control carries a 1-Year Warranty. 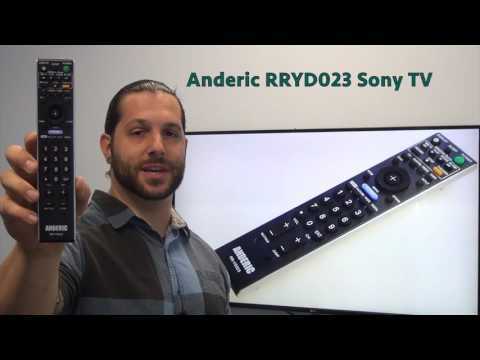 The Anderic RRYD023 remote control replaces many original equipment Sony TV remotes. The RRYD023 will work right out of the package for compatible Sony TV models listed (but not limited to) without any programming. The RRYD023 is a pre-programmed Sony TV remote and cannot be programmed to any other devices. The remote includes popular features like MENU, INPUT and of course, all other buttons for normal operations. For detailed information on how to use this product with your TV, please refer to your TV's operating manual. This remote comes with a 1-Year Replacement Warranty. Liked the original Sony remote better, but it's no longer available and the replacement is perfectly ok. Ordered this as a replacement for my daughters sony tv remote. It worked right out of the box with no programming required. Finding it impossible to find a remote at the local Sony store I ordered online. Received the remote quickly and it works fine. Would recommend this product. by Ellen on April 04, 2019. A different look, but works just fine. by Harold on April 02, 2019. The Remote WasI Needed,Sony Wega Don't Make This Model Remote Anymore,But It Works. by Raymundo on March 26, 2019. We needed this to replace our original remote, when the input button stopped working. Works exactly as advertised. Great product so far. by Shannon on March 02, 2019.
by David on February 25, 2019. I didn't purchase this for myself. My son needed one so I ordered it for him. I asked him about it and he said it works fine. by JAN on February 20, 2019. Perfect. Thank you.. Just what I needed! by Sharon on February 20, 2019. Product works as advertised. Little concerned because I rexeived a second unordered same remote 5 weeks after first one arrived. Both have one defect, the "switch to previous viewed channel" button is depressed in on both units. Doesn't want to pop out. Otherwise remotes do all as advertised and specifically it does give one access to tv's menu system. by Paul on February 14, 2019. It is the perfect replacement remote. Worked without any set up. by Suzanne on February 13, 2019.
by Lisa on February 12, 2019. The remote works well but is not an exact replacement. It can do what the other one did. by Fred on February 08, 2019. Item was exactly as described. It works perfectly. It arrived VERY quickly. Ordering was so easy. A very pleasant experience all around! by Jack on February 07, 2019.
by Matthew on February 01, 2019. Lightning fast delivery. Worked perfectly just like the original one. Thank You. by Michael on February 01, 2019. Perfect replacement and super fast delivery. Thanks. by Manuel on January 06, 2019.
by Robert on January 06, 2019. Works just like the original Sony. by Steven on December 23, 2018.
by Joy on December 05, 2018. Remote was replacement for a Sony remote. It works great and was significantly less expensive than trying to find/buy a Sony. Arrived rapidly. by Lee Anne on December 04, 2018.
works perfectly...straight out of the wrapper. Very pleased; very happy with purchase, service, and product. by Donald on December 01, 2018. Works exactly as promised. Controls all functions same as factory remote. by James on November 04, 2018. This replacement remote works better than the original ever did. Very satisfied with this purchase! by keith on November 03, 2018. It does everything I want..
by robert on October 24, 2018. Excellent!!! Fast shipping and device working perfectly. by Carlos on October 15, 2018.
by Linda on October 11, 2018. Excellent! Good price! Fast delivery! by Michael on September 28, 2018. Remote arrived on time. Worked out of the package without any additional programming. by Terry on September 23, 2018.
by Dallas on September 08, 2018. Works as expected with my TV. by Adriana on August 28, 2018. Excellent replacement. I immediately trashed the original remote. The batteries were not the same size, one was a triple A, the other was a double A. Not that big of deal. by Earl L on August 19, 2018.
by Frances on August 15, 2018. Excellent replacement worked as if provided by SONY, but at a much better price. Company was very good at delivery. by Raed on August 15, 2018. Works fine for all functions I use, especially streaming Amazon and NetFlex movies. by John on August 15, 2018.
by Wilmaris on July 21, 2018. Did not have the one I ordered but supplied an equivalent unit that works well and was less money. I would use this company again. Great job guys! by Henry on July 20, 2018.
by John on July 14, 2018. Works great with my old Sony flat screen TV. Just be sure to check the TV compatibility list for your TV before you buy. by Bruce on July 13, 2018. Fast service, great price, works as advertised. by paul on July 13, 2018.
by Gerry on July 10, 2018.
by MAJ Stephen on July 09, 2018. I would rate product 5 starts and didn't only for the reason: Once you drop it, the whole thing falls apart (it is cheaply made hence the low price). I tried to put it back together but couldn't. So my suggestion is find 3 places where you can put tape on it both left side and right side. I did on the top, middle and bottom. I accidently dropped it again a few days later and it held together! So the big pluses are: Great customer service and the remote works beautifully. Another note, I would be willing to pay a little more if it were built more sturdy. Maybe on a carpeted floor it wouldn't fall apart but I have hardwood floors throughout. by Louise on July 04, 2018.
by Roger on July 04, 2018. There is no digital/analog direct access button. Must go to main menu via home button to access. Mute button should not be recessed. by Joseph on June 28, 2018.
by Trafford on June 11, 2018. Worked great right out of the box. Very pleased with purchase. by George on May 25, 2018. Worked right out of the box, no programming needed. Out just like original. by Carol on May 04, 2018. Works very well, but it is a little flimsy. It was dropped like from a 3 ft height (a very common event regarding these things) and it fell apart. Luckily, I was able to put it back together. Still very sweet. by Leonardo on April 27, 2018.
by Bill on February 14, 2018. Not the original but works perfectly. Thanks a lot. by David on January 28, 2018. The remote works really good ! I did not have to to anything but sit back and enjoy the features I needed that my universal remote did not have. I am very pleased with this remote.It is as good as the original SONY remote !! by Linda on January 10, 2018.
by Jerry on December 01, 2017.
by Yvonne on November 30, 2017.
by John on November 27, 2017.
by Peter on November 25, 2017.
by Cathy on November 25, 2017.
by Andrew on November 14, 2017. Got this remore and it works inmediately. No neccesity of a setup with the TV at all. by Jorge on November 07, 2017. Excellent - product works perfectly - delivery was prompt with no issues - thank you. by Bryan on November 06, 2017.
by Tina on November 05, 2017.
by Ann on October 30, 2017. Excellent product and prompt service. Great price for the product, good values. by Jed on October 22, 2017. Replacement Remotes is a great company to do business with. My first remote didn't work so I contacted customer service there was no problem and sent another remote and it works perfectly. by Sandra on October 21, 2017.
by Robert on October 13, 2017. It is great! just put in the batteries and it works! Yay! by David on October 13, 2017. It work exactly like my OEM remote. by Thanh on October 09, 2017.
by Raymond on September 27, 2017.
by Rodney on September 25, 2017. Worked as advertised right out of the box. As far as I can determine, it does everything the original did. I can access the menu functions for the first time in years. by John on September 25, 2017. Works great, better than the original! by Jim on September 25, 2017.
by Donald on September 24, 2017. I am thrilled with the replacement remote I purchased. It has my TV working as it did when new. If I had not replaced the original remote with the Anderic RRYD023 I would have had to purchase a new TV. The only bad part was that if I had not kept the original TV instruction manual which had instructions for the original remote I wouldn't have known how to proceed. I'm a happy camper!!!!! by Martha on September 21, 2017.
by Indigo on September 15, 2017. Very good remote. Works great with my sony tv. Just like my original remote. by Charles on September 14, 2017.
by Debra on September 09, 2017.
this remote is better than the original not as slippery, fits well in your hand. by Mark on August 28, 2017.
by Sandra on July 30, 2017. Smooth transaction & when I added batteries the product worked immediately & perfectly! by Lucy on July 28, 2017. Remote worked right out of the package. Fast delivery. by Adam on July 25, 2017. So far, so good! The volume control is a little slow, but I can live with that. The volume control on the one that came with my TV didn't work at all unless you repeatedly pressed the up/down button ad infinitum, so I am pleased with the replacement. Thank you. by Phyllis on July 25, 2017.
by Lloyd on July 21, 2017. Great price, quick delivery, works as promised. by Lawrence on July 12, 2017. Worked right out of the package. Couldn't ask for more. by Donna on July 07, 2017.
by Parrie on June 30, 2017. Great remote fast shipping does what I need it to - replace a non working original. by Gary on June 25, 2017.
by Stephen on June 22, 2017.
by Harold on June 08, 2017. It worked out of the box for my elderly Mom, who lives 3000 miles away... Thank You! by mark on June 07, 2017.
by RUBEN on June 07, 2017. The remote we purchased is working very well. The service we received was prompt. We are very satisfied customers. Thank you. by Florence on June 06, 2017. Lost the remote that originally came with the TV. After some trouble with battery placement this worked great. Need it to use to cut cable! by Robyn on June 03, 2017. Good after market replacement for an older Sony TV where you can no longer buy the Sony branded remote for a decent price. This one works well and was priced right. by Jim on May 18, 2017.
by Rebecca on May 16, 2017. This remote pretty much has all the buttons in the same locations as the original Sony remote. I tried all the buttons, and so far, everything is reliably working. There are no issues. The remote also arrived on time. by Jupiter on May 16, 2017.
by Kirsten on May 15, 2017. The product was exactly as described... just add two AA batteries and it was good to go. It works better than the OEM Sony remote that often took several button presses to register even when new. I am very pleased - great product and a great price point. by Randy on May 11, 2017.
by Janet on May 08, 2017.
by Tory on May 03, 2017. Works fine. Has all the functions of the old remote. No programming, works right out of the box, just add batteries. by Gary on April 28, 2017. Works well. Some buttons are a little different but for the most part it's just like the original. by john on April 23, 2017. The only problem I have is I cannot find which button to see to allow me to view DVD's and tapes. Help. by Theresa on April 23, 2017.
by Chayanendu on April 19, 2017. Fast shipping, fair price. Works great! by Melvin on April 19, 2017.
by richard on April 13, 2017.
by JIM on April 12, 2017.
by Jeff on April 12, 2017. Unfortunately the remote did not work with our tv. Had to return it. by James on April 03, 2017.
by Richard G on March 29, 2017.
by MARY on March 29, 2017. WORKED BETTER THAN I ANTIPATED! THANK YOU VERY MUCH! TOTALLY SATISFIED! Great product and worked perfectly very pleased. by Vicki on March 21, 2017. Works great and the price was very reasonable. by David on March 21, 2017. This is excellent quality - better than the original SONY. Functions perfectly. by Kristine on March 12, 2017.
by Erick on March 07, 2017.
by Anne P on February 28, 2017. Excellent replacement remote; fast shipping and great communications. by James on February 22, 2017.
by Gerald on February 14, 2017. Fast delivery and both remotes for our Sony TV worked perfectly. Good quality and fair price. by Nancy on February 12, 2017.
by Arthur on February 06, 2017. I'm happy. The remote does all that I expected. by Peter on February 05, 2017.
by michelle on February 03, 2017.
by James on January 30, 2017.
by Mary on January 30, 2017.
by Richard on January 23, 2017.
by Linda Gail on January 22, 2017. Haven't had it too long but so far it is working great! by Courtney on January 19, 2017. I had ordered a rmydo34 because that is the one i know .I have failing sight so this causes a problem .The one supplied is a RR-YD023.It has a different layout and the buttons are much smaller making it difficult to operate.I did call customer service and he explained that the YDO 34 is no longer available I guess I'll have to get a larger magnification glass. by DAVID on January 17, 2017.
by Juan on January 17, 2017.
by steven on January 15, 2017.
by Fran on January 10, 2017.
by Donald on January 10, 2017.
by Judith on January 09, 2017. Replaced my Sony RM-YD026 remote. Just put in batteries and go! No codes to enter. Very similar buttons and placement as the original, so easy to use! Only used for a couple of weeks so far, so I'm hoping it lasts as long as the original. Thanks! by Marta on January 09, 2017.
by Gregg on January 09, 2017. It is an excellent replacement remote. I will always buy from this company. It is easier to use than the original. by Jerry on January 01, 2017. Arrived 2 days before original estimated delivery date and works as expected on a 32 inch Sony tv. by John J on January 01, 2017. Works as expected. Good price! by Tom on December 29, 2016. This replacement functions just fine. With regard to quality and durability, only time will tell. by Jack on December 11, 2016. Great product and fast shipping. 100% satisfied! by Chad on December 10, 2016. Works just fine, just like the original did. I only needed it to change the HDMI settings occasionally. Good price. by James on December 08, 2016. Great replacement remote. Works great. Ordering and processing was easy. Shipment was quick too! by carla on November 06, 2016.
by mark on October 28, 2016.
by Austin on October 28, 2016. It matches the old remote, except the Mute and Jump are on opposite sides. Will order another for the other T.V. by Nancy on October 21, 2016. Indistinguishable from the original it replaces. Works great. by James on October 18, 2016. Works great with my TV. Even has a few features that the original manufactures remote did not have. by Scott on October 18, 2016.
by Alan on October 18, 2016. Arrived sooner than expected and worked flawlessly after installing batteries. by Arthur on October 13, 2016.
by DARRELL on October 13, 2016.
by timothy on October 07, 2016.
by CAROL on September 29, 2016.
general replacement remote for my sony bravia remote. works great. This is not an exact replacement so if you want the exact functions be sure to order a different remote. by matthew on September 19, 2016. Worked perfectly out of the box. Thanks! by Loisanne on September 13, 2016. To be honest I have not worked with it yet but for spare part.Although ,upon testing It has performed well. by Paulo Jose on September 07, 2016.
by mickey on September 04, 2016. While it wasn't exactly a one-for-one replacement for my remote, it seems to control everything. The only complaint is that the mute button is essentially recessed and you have to use your fingernail to press it. The other button labeled "Jump" sticks up and can be easily pressed. The mute button should also stick up as far as the "Jump" button. In fact, it was my mute button on my original remote that caused me to have to find a replacement. Other than that, the service was quick and efficient. by Jack on September 01, 2016.
by Teresa on August 22, 2016. The Remote received was exactly what I was looking for. The service could not have been better. by larry on August 19, 2016. The replacement remote works just like the original equipment remote used too. by Kip on August 18, 2016. Thank you! SUPER fast shipping!Great value! Exactly what I ordered! by Dennis on August 16, 2016.
by Terrence on August 14, 2016. Worked right out of the box! No programming! Excellent! by Joe on August 06, 2016. It does what it was intended for. by Orlando on July 30, 2016.
by Mary on July 16, 2016. High qualty replacement at a great price. Works perfectly. by Craig on June 26, 2016.
function key layout improved, although the power button on the backside was nice. by Bruce on June 10, 2016.
by Carolyn on June 03, 2016.
by Mark on June 03, 2016. It was delivered quickly and works perfectly!! You can't ask much more than that!I will definitely be back if I need a similar product. by Susan on June 03, 2016.
by Victoria on June 03, 2016.
by Hector on May 31, 2016. Easy to use. Works like the original. by Kenneth on May 28, 2016. Easy to use and works well, except for the jump button. It is recessed. Don't know if this is the way it's supposed to be or if it's a flaw. by Kay on May 28, 2016. No programming works as good as the original when new right out of the box! by Robert on May 21, 2016.
by Norman on May 21, 2016. Excellent fully functional remote That works perfectly. by Deanna on May 20, 2016. Does everything the original did. Looks the same. Operates the same. We are pleased with it. Hopefully, our dog won't find it as tasty as the original. by Suzanne on May 18, 2016.
by Gary on May 13, 2016. Good quality! Probably better than the original. by Thomas on May 12, 2016. The remote was purchased to replace one that was lost. It works perfectly, and is of great quality. I had zero experience with Rep. Remotes before ordering. I was a tad skeptical. No worries. The remote ordered arrive promptly. After inserting batteries came the acid test. The remote passed with flying colors. Works like a charm. Seems to duplicate precisely entire function of original. Bravo guys and gals. Very nice service and good buying experience. Exceptional service, shipped quickly, great response to email inquiries. Will use again! features that the original one did. Over all the remote is ok.
by Anonymous on August 28, 2015. Easy to find appropriate replacement equipment, Rapid deliver. Will trade with this vendor again. The replacement remote worked perfectly with my TV as soon as I put in two batteries. Looks right, works identically to the original. Let's hope it wears longer - ***. by Anonymous on May 13, 2015.
by Anonymous on May 06, 2015. Everything was excellent !!!! Will recommend to family and friends !!! by Anonymous on April 10, 2015.
by Anonymous on March 06, 2015. The remote linked right up to the tv. I would tell family and friends to buy their replacement remotes here. It works well with my TV. by Anonymous on February 17, 2015. Recommend this remote to those who need a quality Sony Vizio replacement for their TV. Functions perfectly. A little on the lighter weight side but easy enough to get accustomed to. by Anonymous on February 05, 2015.
by Anonymous on January 28, 2015. Perfect replacement! Would recommend this site/vendor to anyone with the same issue. by Anonymous on January 16, 2015. I ordered a remote for my tv and a remote for my stereo to replace the ones that mysteriously disappeared. I recommend this vendor to anyone who needs a replacement remote that is not available from the manufacturer, or is less expensive than what is available from the manufacturer. The remote is used for a TV with only an antenna input. My wife and I use the remote and am completely satisfied. I would recommend the remotes to anyone I know who needs a spare or replacement remote. Replaces the original Sony remote. Does a great job. An excellent replacement for the original Sony remote at a fraction of the price. very happy with this replacement remote works just as well as the original. by Anonymous on November 05, 2014.
by Anonymous on November 01, 2014.
by Anonymous on October 26, 2014.
by Anonymous on October 01, 2014. This remote replaced a damaged factory original for all my HD TV's functions. Forethought warned that this unit controlled the TV only which prevented any disappointment once I received it. Good feel to the push buttons whose layout matched the most frequently used functions of the factory remote. I'd recommend this product to a friend on it's value alone. by Anonymous on September 05, 2014.
by Anonymous on July 22, 2014. I really don't use the remote as much as I have Direct TV and utilize their remote for most functions. Unfortunately some functions of the TV remote needed to be used and that is why I needed a replacement. Worked as well as the original. Excellent company to do business with. Was packaged extremely well with no possibility of damaging the remote in shipping. by Anonymous on July 21, 2014. Not as good as the original but very good anyway. Yet to actually use the product, so I can only comment on the supplier and its service. Just starting to use the product so not sure about longevity, but so far it works very well. by Anonymous on July 15, 2014.
by Anonymous on March 29, 2014. Works great. Perfect replacement for our Sony flat screen. by Anonymous on January 22, 2014. Product works great. I would recommend you the site to anyone who needs a replacement remote. This is a replacement for my original Sony TV remote that was recommended. It works great! Quality is excellant. I would recommend this product. Worked as advertised. Much less expensive than the Sony remote it replaces. by Anonymous on December 07, 2013.
by Anonymous on November 29, 2013. The remote works fine...does not have all the options as the original but it works. by Anonymous on October 26, 2013.
remote is not as heavy as factory but worked right when I put in the batteries. by Anonymous on July 06, 2013. My replacement remote worked perfectly. by Anonymous on June 08, 2013. It works ok including the internet functions. Good thing is it is 3 times cheaper than the original. Also lighter and smaller. by Aykut on November 27, 2012.
by Ed on October 21, 2016.